Besides beautiful beaches and white sand bathed by a blue sea, the capital of the Paraíba State is a city with very unique characteristics. One of the most ancient cities in Brazil, João Pessoa was founded in 1585 and has a rich architectonic patrimony, including the beautiful baroque structures, like the church São Francisco and the convent Santo Antônio, dating back to the XVIII century. João Pessoa is full of preserved natural forests, squares and gardens, which is why it is considered one of the cities with the highest index of green area per inhabitant in the world. Another beauty of the city is the Ponta do Seixas, the easternmost point of South America, which can be seen from the majestic Farol do Cabo Branco (Cabo Branco Lighthouse). There are many excellent places for boat strolls near João Pessoa, like the natural pools of Picãozinho on the island Areia Vermelha. A tradition not to miss is watching the unforgettable sunset on the beach Jacaré, to the sound of Ravel’s “Bolero.” There are also buggy strolls available on all the beaches. 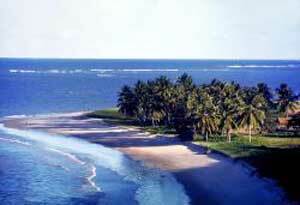 Tambau, one of the main beaches in João Pessoa, also has an exciting nightlife. The traditional northeast cooking is plentiful in João Pessoa. Many restaurants serve salted meat, one of the most famous specialties on Paraíba State. The regional craftwork made with clay and oakum can be purchased on the Mercado de Artesanato Paraibano (Paraibano Craft Market). Picãozinho is a formation of corals, in front of the beach Tambaú, which forms natural pools in low tide, making it possible to view a sea of beautifully colored fish. Another natural formation, that also generates fabulous pools in low tide, is on the island Areia Vermelha, which produces a sandbank about two kilometers long and one kilometer wide, making it a perfect place for swimming. The access by boat takes approximately 15 minutes. A must see is the beautiful baroque style architecture of the convent Santo Antônio and the church São Francisco, buildings that date back to the XVIII century. The church altar is adorned with gold and magnificent Portuguese tiles. It’s also worthwhile to visit the churches N.S. da Guia and N.S. do Carmo, and the Palácio da Redenção (Redemption’s Palace). All three of these buildings date back to the XVI century. Be sure to make time to visit the Santa Rosa theatre, still in use, and one of the oldest theatres in the country, dating back to 1889. And don’t miss the fort Santa Catarina, with cannons that are more than 400 years old, in the town Cabedelo, 25 km from João Pessoa. Hotels with different levels of comfort are near to all the beaches. Besides the restaurants that serve the regional dishes, there are many other culinary options. The city has a good transportation and communication structure, car rental and tourism agencies, and many bank branches. João Pessoa is on the northeastern region, 2340 km from Brasilia, 1762 km from Rio de Janeiro, 2440 km from São Paulo and 111 km from Recife. Its airport receives flights from all capitals and the main cities in the country.